I purchased BJ from a property on the other side of Melbourne from where I live at Easter time (Autumn), just over a year ago. He was a real sweetie for such a big horse (16.2 hh), as I am only short. I was originally looking for something a bit smaller, but because he was so quiet and had a great personality as well as great movement, I fell in love. He travelled the three hours home in the float no problem and settled in nicely to our temporary property in the Macedon ranges. About a month in, he started displaying some unusual behaviours, primarily head tossing, but also when I look back, he would sweat a lot after a ride and all of a sudden was not happy about being bridled. I completed the usual tasks with a new horse, dentist, chiropractor, farrier, etc. The dentist commented that he had a very sensitive neck and came back after his first visit for another examination because I thought his teeth must have been causing the head tossing. He actually x-rayed his whole head to see if there were any unseen problems. Nothing presented itself. I had the chiropractor out a few times because BJ would slightly collapse his back end going around corners and I thought he must have slipped over in his paddock. BJ had also gone from being very relaxed and happy to now charging around on the forehand with the occasional hissy fit when asked to canter. I attributed this to us still getting to know each other. Looking back, other odd behaviours included being very stressed and distracted on the lunge, very herd bound and would also have short bursts of naughtiness at feed time. Very unlike his character! As time wore on, all of BJ's odd behaviours seem to disappear, so I thought we were now well and truly bonded and he was always the gentleman. We were having some great lessons through winter and I was looking forward to going to our first competition over the summer season. We moved onto our new property at the end of winter and all seemed okay in Spring and Summer. We went to our first competition in early March, where Mr. Cool was a bit overwhelmed by lots of horses and the competition environment. But we managed to survive the day and ended up about middle of the pack in our new higher level. I was quite happy with that, but noted that I needed to make sure next time that we had plenty of time to settle beforehand. About this time, I opened up BJ's second paddock so he could enjoy a bit more grazing space and the new green grass after the recent rains. After this, our regular weekly lessons started to go downhill. The relaxed, happy horse would be quite sweaty from the ten minute trip in the float and be quite distracted in general. BJ started head tossing again and the odd time of trying to bite at the girth while I was riding. He would also plunge his head down to rub on his legs and not bend or relax at all, never mind the constant flapping of his gums! At one stage I could not even get him to trot without really upsetting him. After one such non-lesson where he was drenched in sweat, I took him home and put him on the lunge to see if he could relax, however he just head tossed incessantly and was quite upset, particularly if we tried anything other than a walk. He was very mopey in his paddock so I gave him a few weeks off and had another manipulation done. Back on the lunge and this time he tried to charge off and just about pulled me off my feet. Very uncharacteristic! He would also have short, explosive bursts of being angry, just whilst being led around. What happened to my sweet horse!?! I really needed help! A few of my friends called me after reading the article about myo-toxins in chaff chat and suggested I give Lucy Prior a call. We are now a few days into the Gotcha Feed Plan and now I have limited BJ's grazing options to just his small paddock (very little grass). I have taken him off any processed feed and also the nice new Pasture/Clover Hay I recently purchased. He is now just having chaff, the Gotcha Equine range, salt and not so rich, grass hay. We will see how he goes. Week 1. Exactly six days into the plan, I thought I would try a ride to see how BJ was travelling. He seemed to have calmed down in the paddock and on the lunge was much more settled, although still flapping his lips and head tossing a bit. Once riding though, after a few head tosses, I managed to have the majority of a ride without any head tossing. What an improvement! I would say that after not quite a week on the plan (even though I did not start him on plain grass hay until about three days in), he had improved about 60-70% on his previous performance. He also wasn't anywhere near as sweaty. Pretty impressive results so far. Week 2-3. For some reason BJ now seems considerably worse. He stands in his paddock shelter out of the sun, spasmodically flicking his head. He looks really upset and as an owner, it is quite distressing to watch. I have now put a small electric fence in his paddock so he only has a limited area of access. Unfortunately, we have moist nights and warm sunny days, so the grass is doing its best to try and beat me! I have also sourced some particularly low nutritional value grass hay from my lovely hay supplier. Week 4. I have now increased BJ's salt intake to four tablespoons per day. As I don't have access to a yard where I can remove BJ from his paddock, I am now moving the electric fence to allow only access to the areas around his box and the water trough. I know the previous owner of my property (which used to be an apple orchard), so I have been able to ascertain that up until about twelve years ago the land was fertilised annually with NPK (nitrogen, phosphorus and potassium, with extra potassium for promoting good fruit growth). Not great news. No wonder BJ is unwell! I am trying to be patient with this whole process, but it is heart breaking to see your best friend so unwell. Week 5. The vet undertook a thorough examination on BJ and also suggested that he would like to do some blood tests. The tests were completed and all the results were in the normal range, however the potassium reading was at the top end of this normal range (4.3). The vet suggested a two week trial medication for BJ with Tegratol, a drug used for treating epilepsy in humans. Apparently there is a link to epilepsy and the trigeminal nerve. Week 6 and 7. BJ seems to be okay standing out in the sun now, I think that is a small improvement. I did take him for a hand walk, just to relieve his boredom from his small patch of dirt and he only displayed the odd head flick. I'm hoping he is feeling a bit better. This is certainly a very frustrating process when many of my friends are out and about enjoying their horses. I have even resorted to having small rides on my other retired racehorse (who has not been ridden for in excess of twelve months). He is only six years old. His knees are badly damaged from racing and he is the paddock buddy. Whilst he is very kind, I don't think he appreciates my good sentiment of making sure he is living life to the fullest! Week 8. The vet suggested that I try BJ for a light lunge and maybe a short ride. I noticed an improvement in his ability to walk on the lunge without seeming to drag or tangle his back legs. I tacked up and aimed for a gentle ride/walk on the arena, however it only took about five to ten minutes for him to start tossing his head. I didn't want to get him upset so we left it at that and I returned him to his small area of paddock, devoid of grass. Obviously the drugs prescribed by the vet (Tegretol and Periactin) have had no affect on his condition, so I am planning to take him off this medication and just be patient with his mineral supplements. At least I now have some time to devote to my garden and the horse poo is easier to pick up from a smaller area! Week 10. BJ seems to be moving around his paddock/yard quite well and cantering to me when called. I pulled him out of the paddock and just went for a quiet ride (walking only) around one of the other bigger paddocks. We were able to walk around for about half an hour pretty much with very little head tossing. It was a bright, sunny day (head tossing/shaking seems worse on bright, windy days) so I was pleased in the improvement. However, this small session seemed to set him off again and for the rest of the day he stood in his box and tossed his head and seemed quite upset again. You can see on his back toes where he has been dragging his feet, though in general he seems a bit more coordinated now. I feel like I am living a rollercoaster ride. One step forward and about three backwards. I do feel bad having him locked up in a small area for such a lengthy period of time and I am tempted to turn him out for the winter on to the paddocks with longer grass with is friend. But I will wait a few more weeks before I make any decision there. My other horse is now also displaying similar symptoms so I have started him on the Gotcha Feed Plan as well. Week 11. For some reason BJ seems to be considerably worse. We have had a few very wild and windy days, which seems to have triggered his head tossing and he is back to staring off into the distance. I spoke to Lucy and she advised me to adjust my Gotcha Feed Plan doses, increase the salt amount again and dissolve it in water before applying it to the feed, and also add speedibeet for extra fibre. Week 12 - 13. I can't believe I am writing this, but BJ has miraculously turned the corner and I mean, really, really improved! I dragged him out of his small yard after three months of no activity and loaded him on to the float and took him to a clinic, just expecting us to watch. I thought the change of scenery might do him good. I was planning to take the paddock buddy to the clinic, but he is so bad with grass tetany that he needs to rest. Two weeks ago BJ was standing in his box flicking his head, now he is relaxed, happy, interested and we were able to participate in some riding activities as well as ground work without any excessive sweating. I didn't push him though, so we just did small bursts of activity and only if he was comfortable. NOT ONE MAJOR HEAD TOSS ALL WEEKEND! He had a blast and was so well behaved. Last time I tried to put him in a stable he nearly kicked the wall in, this time he thought it was fantastic as he could look out and see all the activity and chat to anyone who passed by. I know he is not completely well yet, but certainly I feel now that I have my horse back and I am confident that my other horse will be able to overcome his head flicking and other symptoms as well. BJ was always troublesome to shoe as it was difficult for him to balance while he held up his back legs. My farrier would request that I worked him first to get rid of some of his excess energy. After some time on the Gotcha Feed Plan, he is now a dream to shoe and my farrier is most impressed. I recently took BJ out for his first dressage lesson in four months. It was pouring rain and blowing a howling gale. Not ideal weather for our first outing. We were going to an indoor venue where BJ had not been before. There were mirrors on the wall, trees scraping against the outside of the building and we had to walk past some large, blue, flappy plastic to enter. BJ was fantastic, he barely looked sideways at the plastic and didn't blink an eye at the mirrors or at his new indoor environment. Our lesson was great and we even managed to do quite a bit of canter work on the circle. Not bad for a horse that four months ago, could barely canter at all without getting tangled or throwing a hissy fit. I firmly believe that without the support of Gotcha Equine and the precise supplement feeding regime, BJ would still be very ill and unhappy. P.S. We are currently having our soil tested so we can address any deficiencies (you can also talk to Lucy about having soil and grass testing done). Interestingly, we have a lot of Olive Trees on our property that never seem to fruit. Apparently they need sufficient magnesium to fruit! Annette Hatherley (Happy Horse Owner), Victoria. 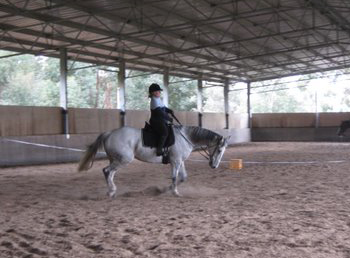 Kyneton and District Adult Riding Club (ARC) member.